The Black Strat is the Fender Stratocaster guitar owned and played by David Gilmour, who is the guitarist for Pink Floyd. This guitar is so unique and so associated with Gilmour that Phil Taylor, Gilmour’s guitar technician, published a book in 2008 called The Black Strat. In it he details the guitar and it’s history. I am utilizing much of this information. 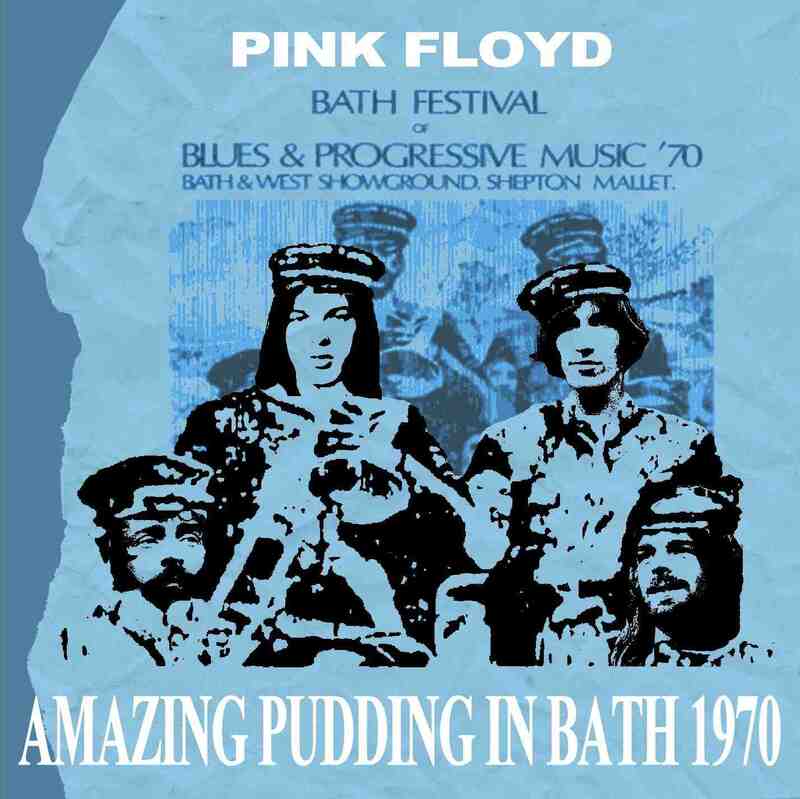 The first time Gilmour used the guitar was at the 1970 Bath Festival. 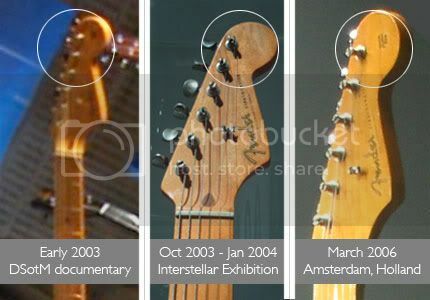 Gilmour purchased this guitar that same year from Manny’s Music in New York City to replace another Stratocaster that was stolen during a tour. This Stratocaster originally was finished in three-color sunburst, but had been repainted black at Manny’s. It also had a large Fender headstock. Gilmour must be a bit of a tinkerer, since the guitar has undergone innumerable changes externally and internally. 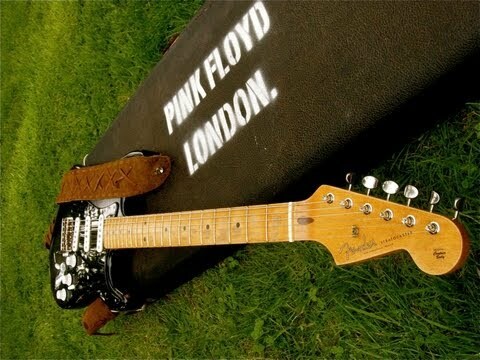 Gilmour still favors this guitar. Fender borrowed it for their Custom Shop David Gilmour model. During the 1970’s Gilmour frequently switched out the necks between maple and rosewood Fender Strat necks. 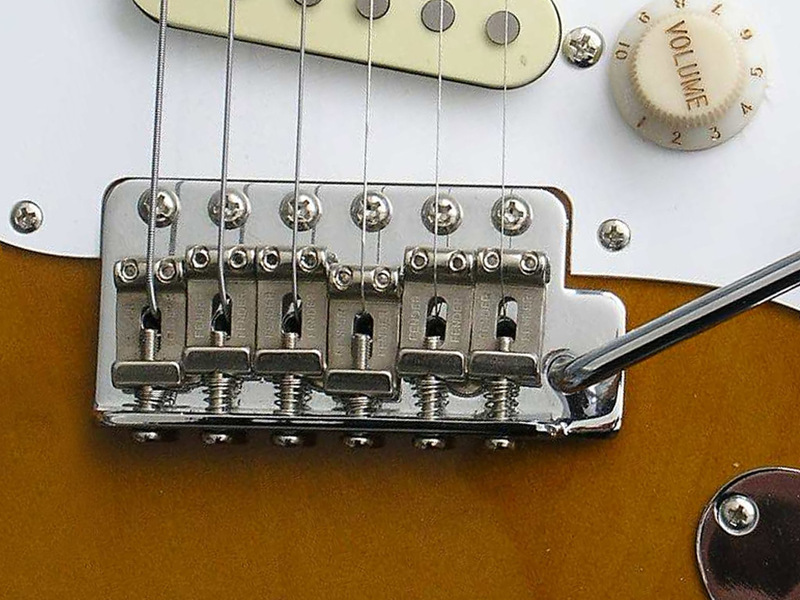 In 1971, Gilmour replaced the volume knob with a Telecaster knob. The change did not last long. He replaced the original volume knob. Sometime in 1972 Gilmour installed and XLR connector for the guitar’s input to reduce the hum generated by his Dallas Arbiter Fuzz Face distortion pedal. The guitar’s signal was radically reduced so he reinstalled the original ½ inch input. During these years he also replaced the guitar’s tuners with Klusons. 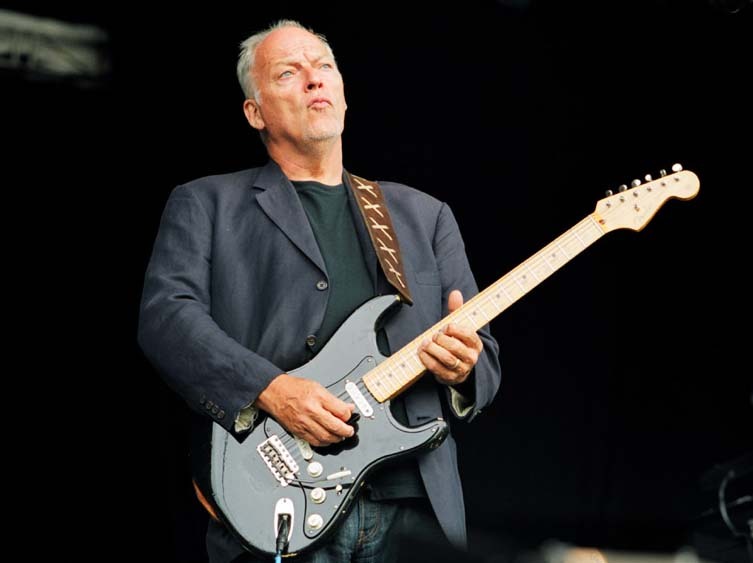 During this same year David Gilmour swapped out the original maple neck with a 1963 rosewood Fender Stratocaster neck. He still had the original 3-way selector on the Black Strat. 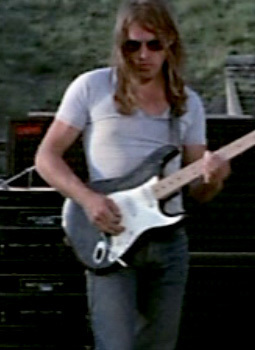 In 1973 Gilmour was still concerned about pickup generated hum, so he installed a Gibson PAF Humbucker between the bridge and middle pickup position on the Strat. He saved the original single coil pickups and put them in a black Strat pickguard. 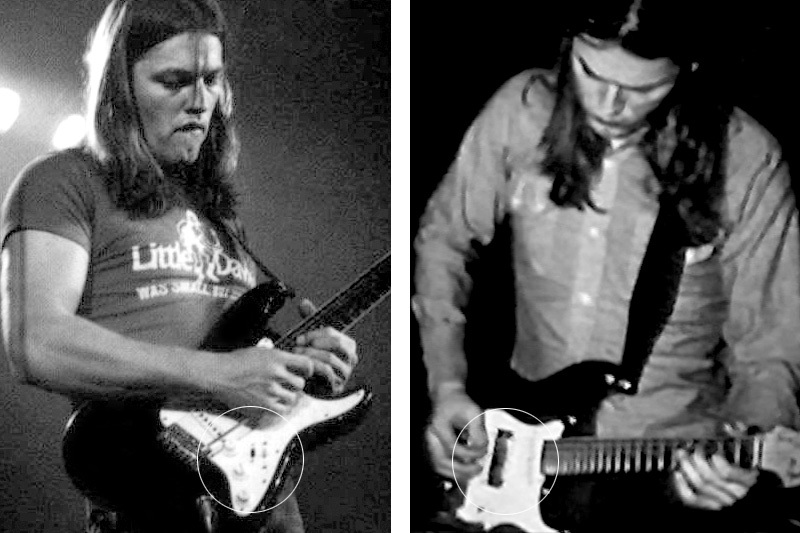 Essentially Gilmour now had a four pickup guitar. That same year he also replaced the bridge assembly on the Black Strat with a Fender Bullet Strat bridge assembly he had on another guitar. 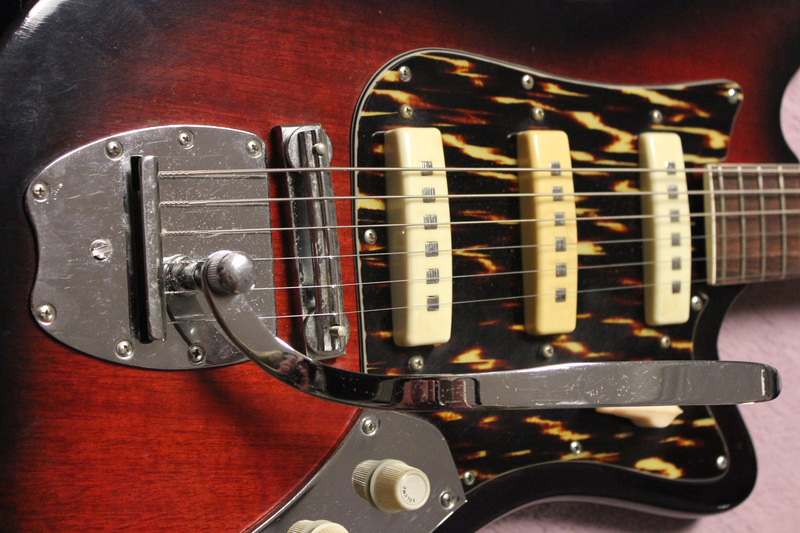 In 1974 the original 3-ply pickguard was white and originally equipped with the standard 3 potentiometers. Gilmour installed a new black pickguard . This one was a 1-ply black beveled acrylic model with 11 screw holes.. A mini toggle switch was located on the pickguard to allow for the neck/bridge pickup combination. He apparently was still searching for “that sound” because in 1976 the original bridge pickup was replaced by a DiMarzio FS-1 pickup. Later that same year the DiMarzio was replaced with a Seymour Duncan SSL1. By 1978 Gilmour swapped out the 1963 Fender neck for a 22 fret Charvel/Jackson neck that came replete with Fender decals on the headstock. The stock Fender tuners were replaced with Klusons. Perhaps the most unique feature of The Black Strat is it’s short tremolo arm. Gilmour started using the shorter arm in 1984 when he replaced the original Fender tremolo synchronized unit with a Kahler system, which involved additional routing to the body. After this he had the tremolo arm cut down to 4 ¼ inches from the standard six inch Fender original equipment version. The tuners had to be changed to locking tuners due to the Kahler installation. In 1985, Gilmour installed a 5-way pickup switch. 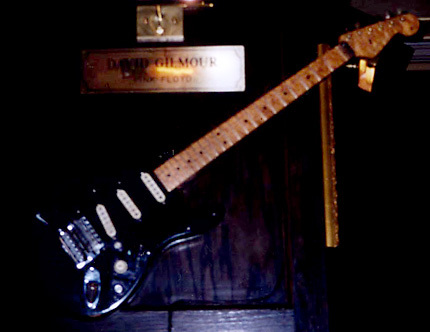 It was in 1986 that Gilmour retired The Black Strat allowing it to be displayed at the Hard Rock Café in Dallas, Texas. 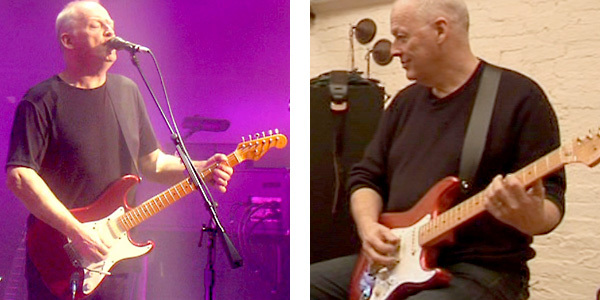 Gilmour replaced The Black Strat with three 1957 reissue Candy Apple Red Stratocasters. All of these guitars were equipped with EMG pickups. 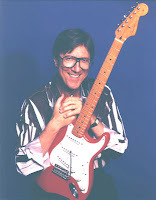 He also acquired a Cream coloured Stratocaster that he used primarily during the Roger Waters tours. In 1997 Gilmour retrieved The Black Strat. A guitar tech went to work on it by removing the Kahler tremolo assembly and filling in the routed area. He replaced this with a Fender Synchronized Tremolo bridge unit. A new 1957 reissue Stratocaster neck replaced the Charvel/Jackson neck. 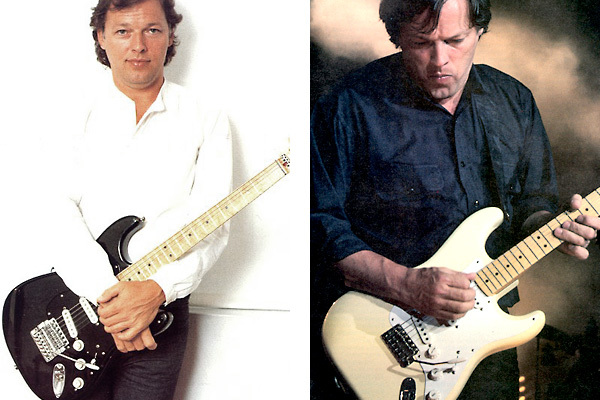 By 2003 Gilmour put the Black Strat back to work. 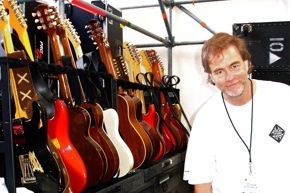 He used it on the 2005 Pink Floyd Reunion tour called Live 8 and the 2006 On An Island tour and for the Dark Side of the Moon documentary. By 2005 Gilmour swapped out the 1960’s neck for a new 1983 Fender 21 fret 57 reissue maple neck with a C shape and a 7.25” radius. Fender contracted with Gilmour and his guitar technician Phil Taylor in 2008 to create the David Gilmour Signature Black Stratocaster. Taylor was key in its design. His notes from that period are the basis for his book. 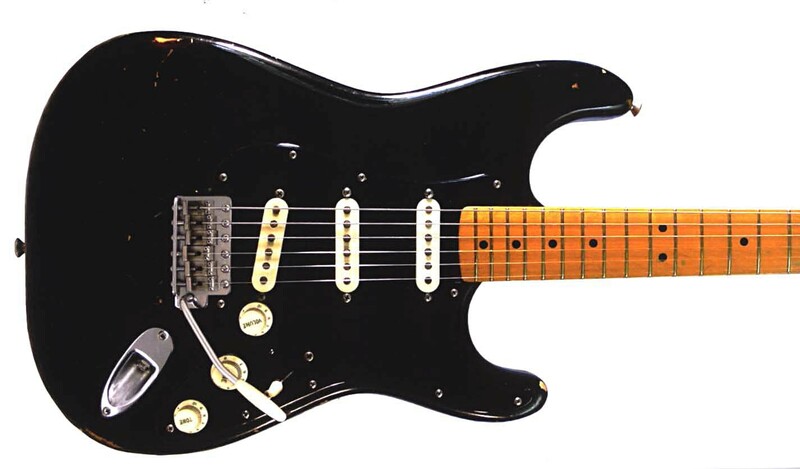 The Black Strat is featured on many of Pink Floyd’s hits, such as Money and Shine On You Crazy Diamond. The original guitar purchased from Manny’s had a 1968-69 alder body. Perhaps this is the only part of the guitar that has remained unchanged. Much of the modifications were done through the years to improve the guitar’s sound quality and eliminate hum. 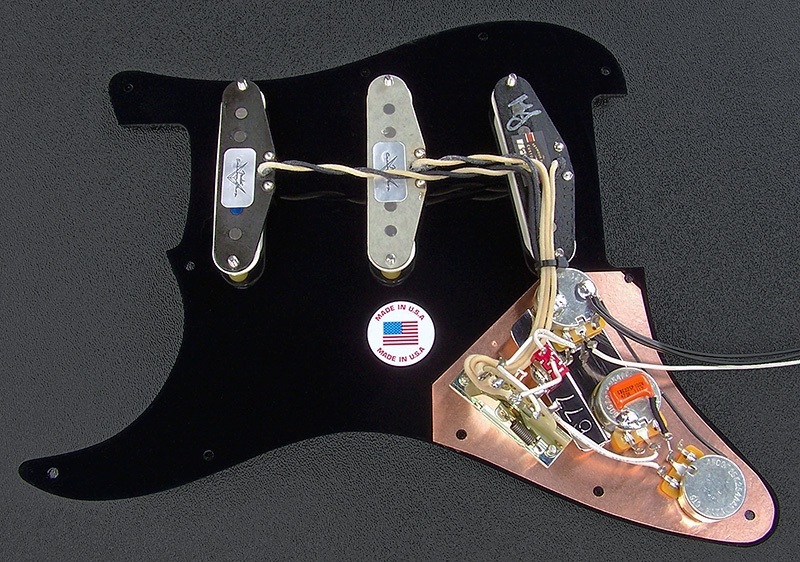 The back of the Black Strat's pickguard is covered in copper foil to provide shielding. The ground connection has been rewired. The volume and tone potentiometers are connected directly to the output jack. 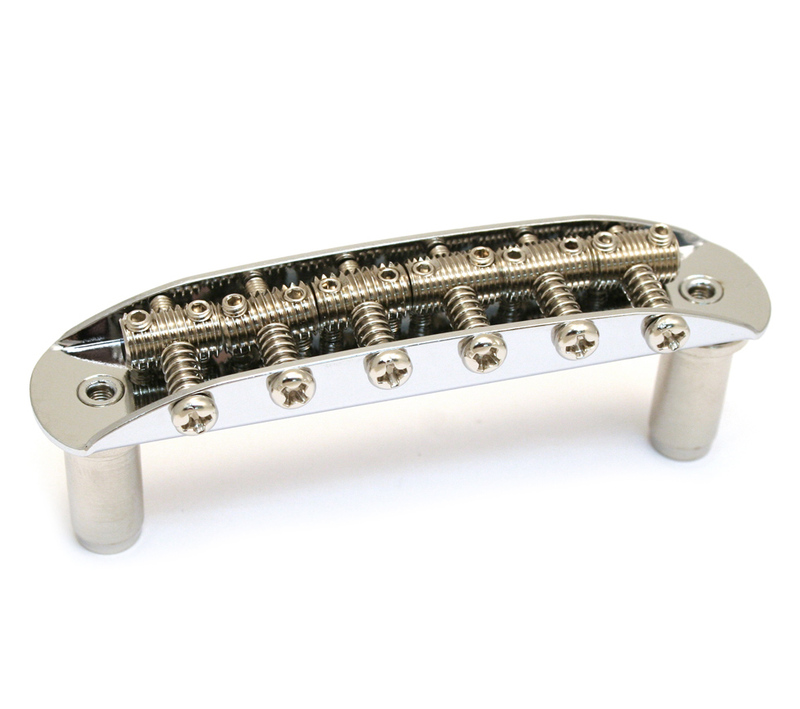 Gilmour tightens down the outer two bridge plate screws, but loosens the 3 inner ones to aid in tonality. He only uses 3 springs for the synchronized tremolo. Which came first, violin vibrato or guitar vibrato? I do not know the answer. However I can safely say that dating back centuries, violinists and guitarists first used their fingers to create vibrato of a note. A method still in use. 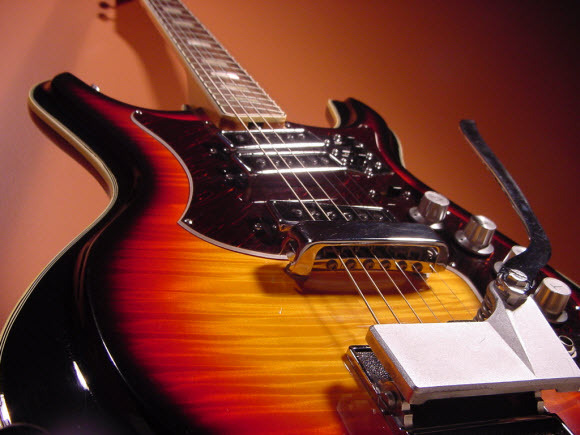 At some point in time an inventive person decided there must be an easier way to achieve vibrato on the guitar, and thus the whammy bar was created. Through the years it has been given different names. Bigsby called it a Vibrato. Gibson Guitars originally called it a Vibrola, as did their affiliate Maestro. Kaufmann/Rickenbacker also used the term Vibrola. Fender Guitars erroneously called it a Tremolo. Vibrato is a fluctuation in pitch, while tremolo is a rapid fluctuation in sound volume. 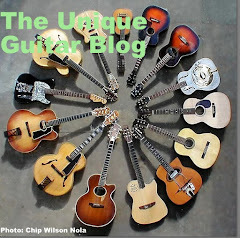 All of these devices achieved the same goal, to lower or raise the pitch, of a guitar. The original intent was to do this at the end of a musical phrase, to give a subtle hint of sweetness to the song, although many guitarists have taken this far beyond the limits of what it was intended for to fit the sounds of each generation of music. Blues players use it to make their guitar cry and metal heads use it for dive bombing effects. I wish I could find a picture of one of the first vibrato attachments I had ever seen. This unit sold for around $15 USD back in the early 1960’s. It attached by means of a clamp to the section of guitar strings between the saddle and tailpiece of an archtop guitar. I probably cannot find a picture since it was a really pathetic idea that most likely did not work. The first vibrato ever mentioned in literature was an attachment to the Rickenbacker Electro Spanish guitar. At the time it was called the Vibrola Spanish Guitar. 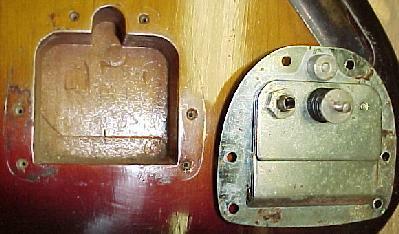 A motorized vibrato/Vibrola unit was housed in the back of the guitars body. The body was nearly twice as deep as the regular Rickenbacker Electro model. Within the body was housed a motor, flywheel, rheostats and pulleys that generated a pulsating electrical driven vibrato sound. Air holes were installed to cool the motor. This instrument was available as a package including a 15 watt Rickenbacker amplifier with a twelve inch speaker. An adjustable stand was mounted on the amp. In 1938 this could have been yours for $198.50. Which was indeed a lot of money at the time. 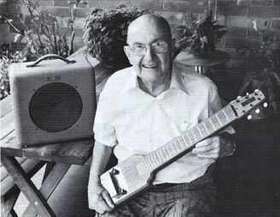 Arguably Doc Kaufmann of Rickenbacker patented the Vibrola that was the first commercially available by his patent for a manual guitar vibrato device. The Kauffmann patented Vibrola was a regular feature on many of the Rickenbacker Electro Spanish guitars. For those of you not familiar with Rickenbacker history, the company was started by Adolph Rickenbacker, George Beauchamp and Doc Kaufmann. 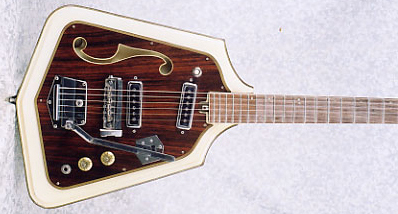 It was Kaufmann that came up with the design for the Rickenbacker “Frying Pan” lap steelguitar. Kaufmann’s Vibrola came with a short handle that was adjustable for length. Moving it in a downward motion lowered the pitch of the strings by means of a spring-tension devise. Moving the Vibrola upward raised the pitch. This Vibrola was string grounded to the output jack in the control cavity. Perhaps the most unique feature of the Kaufmann Vibrola is that the original units were attached to the bottom of a trapeze tailpiece. This caused the tailpiece to move, which in turn caused the strings to move with the movement of the vibrato arm. 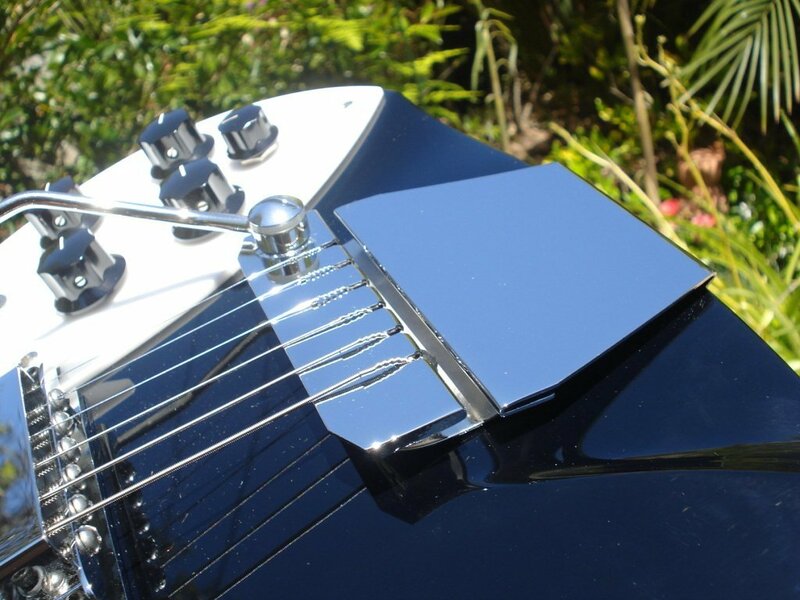 The latest Rickenbacker guitars are no longer equipped with vibratos. In prior recent years Rickenbacker utilized two systems. The first was the Kaufmann Vibrola which I have just mentioned. 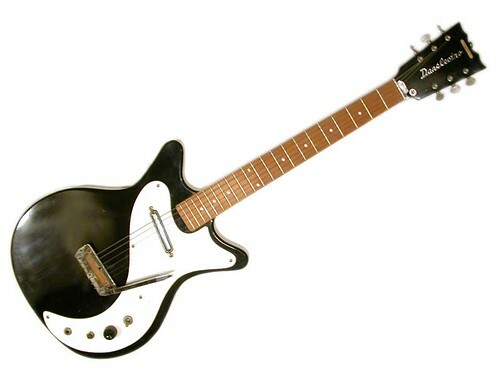 The second unit was called the Rickenbacker Accent vibrato. This unit is somewhat similar to Gibson’s Maestro vibrato, though the Rickenbacker unit mounts through the strap bolt. The strings are attached to the unit’s backside. The front of the unit contains a flat lip and a handle is fastened to this lip. Moving the handle raises and lowers the lip and the string height. The handle is held in place by means of a set screw and a nylon washer. 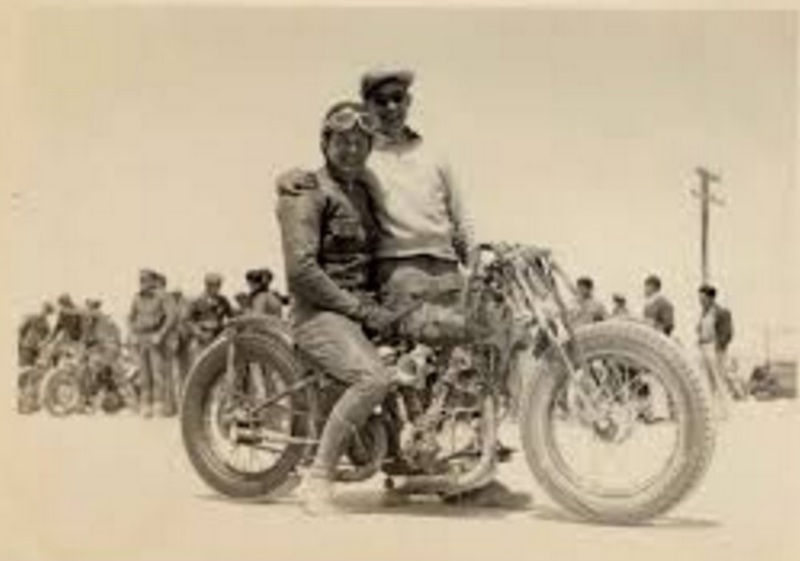 Paul Bigsby started his career as foreman of a motorcycle company. His passion was racing and building motorcycles and fast cars. 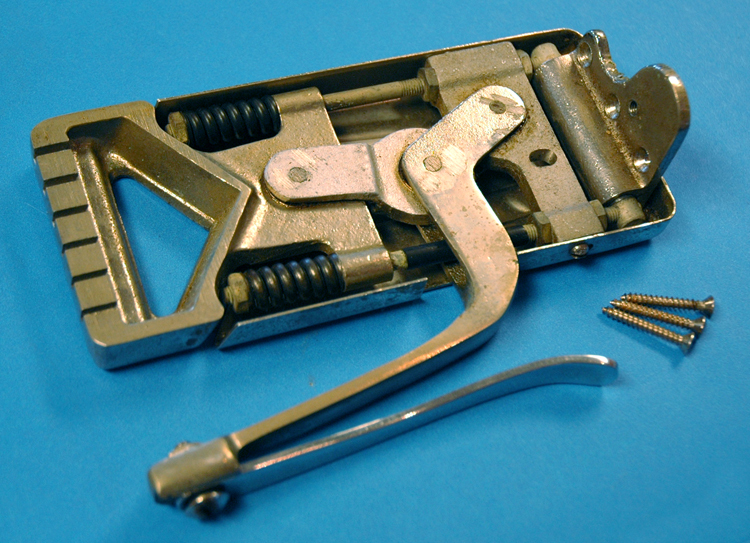 In later life this expertise was valuable in the creation of perhaps the most widely used vibrato unit ever built; The Bigsby Vibrato Tailpiece. 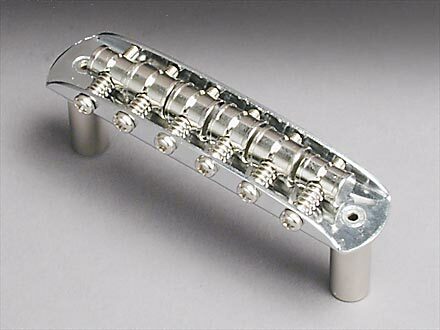 With ‘the Bigsby’ the guitars tailpiece is replaced with this unique device that has posts to attach the guitar strings to a cylindrical bar. A hardened steel lip attaches to the lower rear portion of the device. The lower portion of the cylinder features a steel arm that allows the cylinder and strings to rock up and down. Between the lip and strings is a heavy duty spring. The strings are fed under another steel bar to guide them to the bridge saddle. Interestingly, Bigsby’s first vibrato arms made use of the valve springs from Harley Davidson Motorcycles. In later years he milled his own parts. 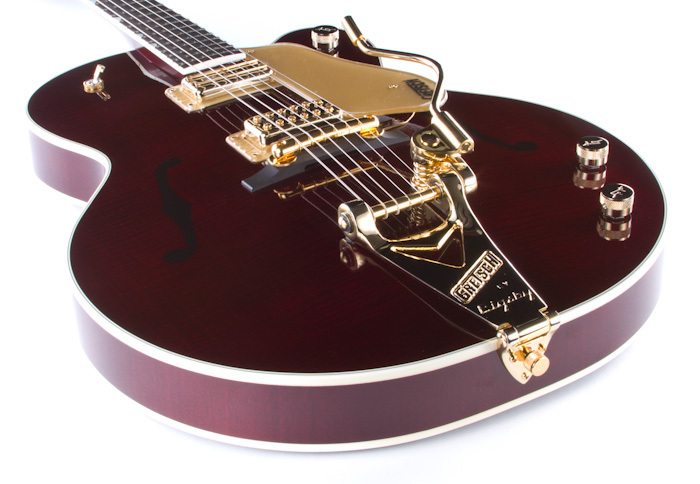 Perhaps the three greatest users of Bigsby Vibratos were Chet Atkins, Merle Travis and Lonnie Mack. Most all of Chet’s stage electric guitars featured a Bigsby Vibrato. Chet changed the flat arm of his vibratos out for a short steel rod with a steel end tip on it. Merle Travis is well known for his customized Gibson Super 400. He utilized the same style Bigsby tailpiece as Chet Atkins, but changed his handle out for a long steel rod. The end of this rod was bent into a circle. Lonnie Mack purchased one of the first ever Gibson Flying Vee guitars from a Cincinnati music store called Hughes Music. 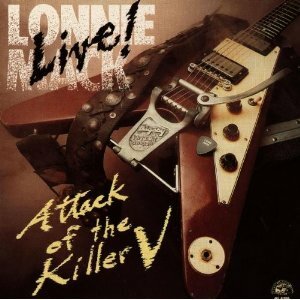 Lonnie’s regret at the time was the Flying Vee did not have a vibrato unit. 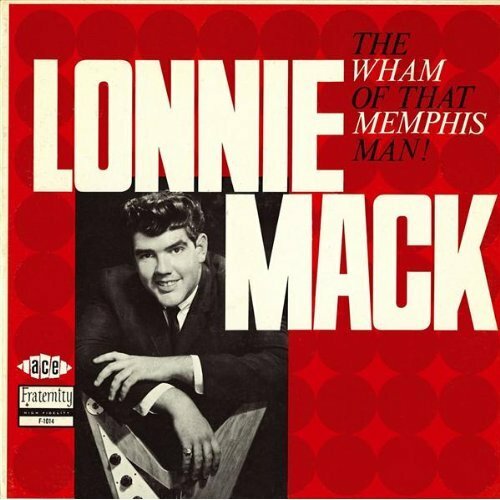 In fact on the cover of Lonnie Mack’s first LP, ‘The Wham of that Memphis Man’, you can see a very young Lonnie posing with the upside down Flying Vee sans vibrato unit. Mr. Hughes offered to retrofit that guitar with a vibrato. 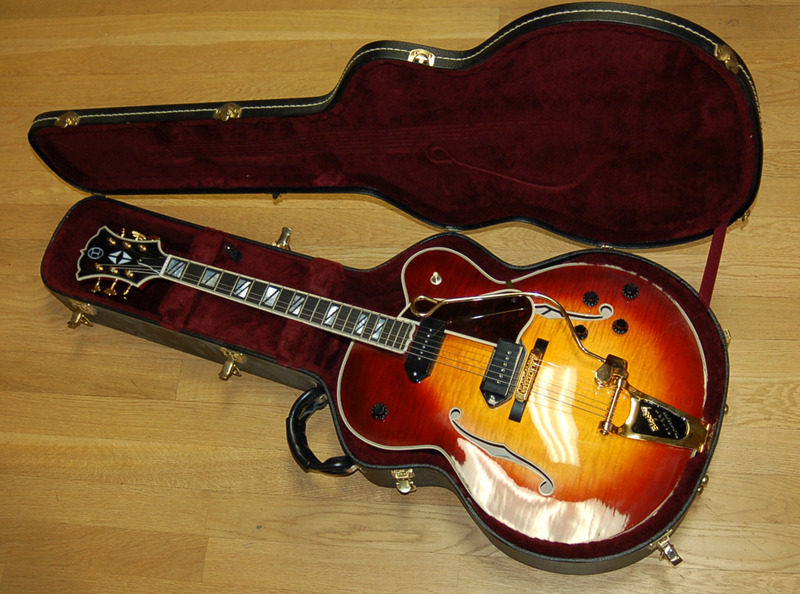 He took the Bigsby Vibrato version that was meant for archtop guitars, the B700, and screwed the base of the unit onto the lower portion of the guitars body. The remaining name plate section dangled between the Vee’s wings. This was attached to a bent stainless steel bar that was fastened between the guitars wings. Out of these three men, Lonnie made the most use of the vibrato for bending the notes. The rest of his signature sound came from the ‘True Vibrato’ feature of his Magnatone amplifier. This amplifier was later replaced with a more road-worthy Roland JC120 with it’s chorus feature. 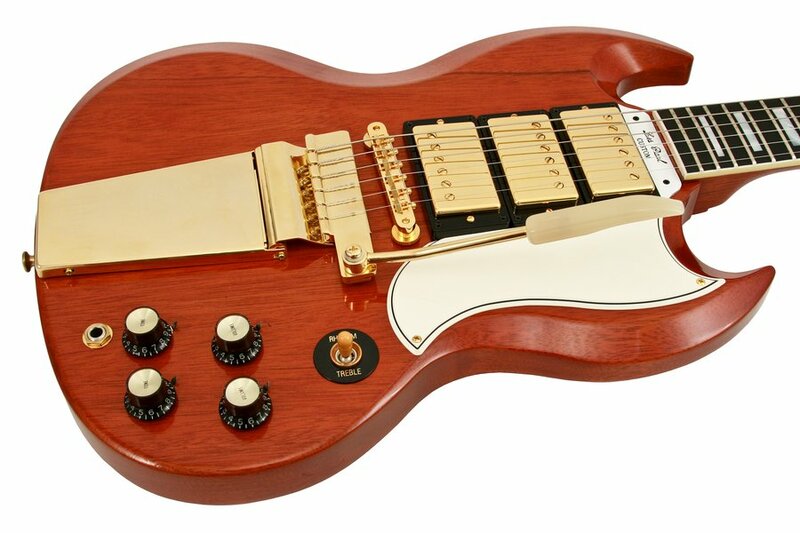 The Gibson Vibrola is usually associated with early Gibson SG guitars. It made its debut in 1962. There are two unusual features about this device. The first is that it moves side to side, rather than up and down. The second unique feature is the lever arm attaches to the side of the unit rather than on the top. This is due to the sideways movement of the unit. 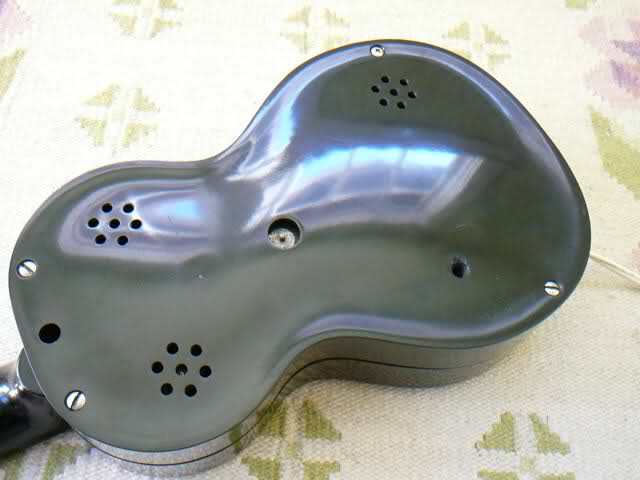 The Gibson Vibrola came with an attractive cover plate that hid the spring and levers that operated the unit. A few years later the Gibson Vibrola became an option for their ES-335 model. The lever arm was unusual in that if the player desired to move it out of the way, it folded in half. This design never gained much popularity. 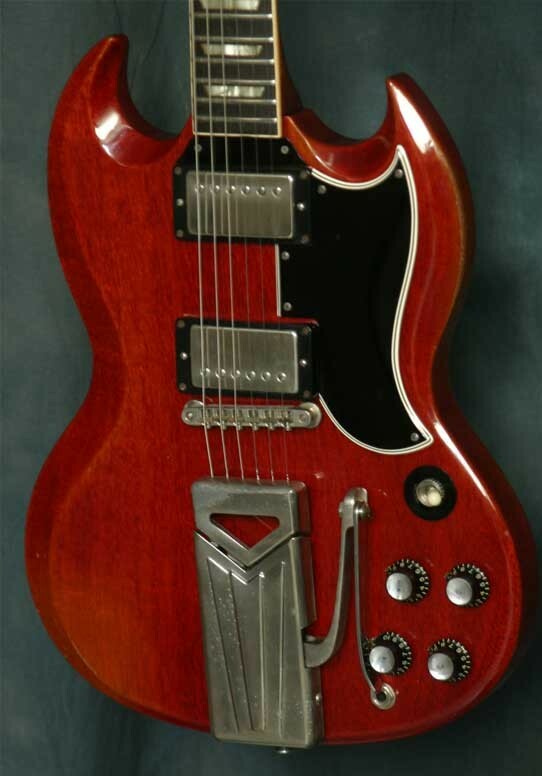 The usual suspect one would find on a Gibson SG was the Maestro Vibrola. Most other manual vibrato devices employed a coiled spring, but not the Maestro. Essentially the unit employed a flat rectangular metal lip that was somewhat malleable. An arm was attached to the lip at the top and at the distal end were slots to attach the strings. The unit was held in place by at least 3 wood screws. Many of the Maestro vibratos had a long emblem plate that attached to the rear side of the guitar, while the shorter models did not have the emblem plate. The design of the arm was a stainless steel rod with a large white plastic decorative end piece. This unit can also be found on the 1967 Flying Vee reissue. As with most vibrato units, the guitars tuning suffers when overused. The Maestro Vibrato was very prone to string drift. Semie Moseley created his own vibrato units for Mosrite guitars. He had worked for Paul Bigsby and was very much influenced by Bigsby's designs. His unit is top mounted, much like the Bigsby. Strings are fed through holes in the rear of the unit. The bridge and saddles are mounted on the front of the unit and are stationary. One unique feature is the saddles are 'wheels' that roll with the vibrato usage. This eliminates intonality. 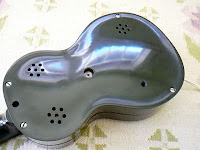 The original units came with mutes, much like the Fender Jaguar or Gretsch guitars. They originally had very small handles meant to be operated by the guitarists' palm. A couple of years later Moseley revamped his vibrato by removing the mute and lengthening the vibrato arm. He included his name cast on the bottom of each unit. These became known as Moseley Vibratos. Moseley was one of a few manufacturers that offered a 12 string guitar vibrato. 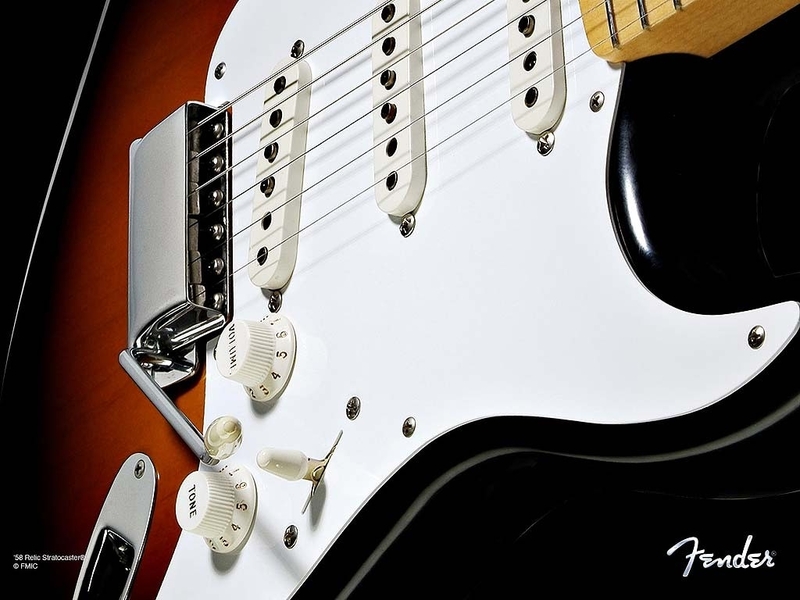 The Fender Stratocaster is one of the world’s most popular and most copied guitar designs. These days when we exam the Stratocaster Synchronized Tremolo, we don’t even bat our eyes. It seems simple and straightforward. However this was not the case in 1954 when Leo Fender invented and patented this vibrato unit. 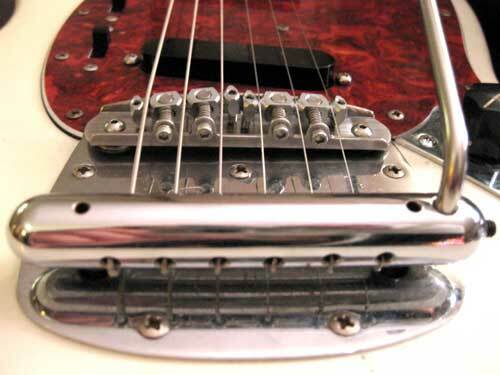 The unit incorporates the six bridge saddles of the Strat. The saddles are mounted on top of a stainless steel plate with a short 90 degree angle lip at the end. This lip allows placement of the screws and springs that hold the saddles in place. Ingeniously these screws also act as compensated adjustments for tuning the guitar. 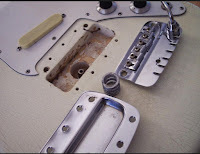 The key to the Strat tremolo is on the other end of the plate. Just above the point where the six wood screw attach the plate to the body is a beveled end that allows for up bends. 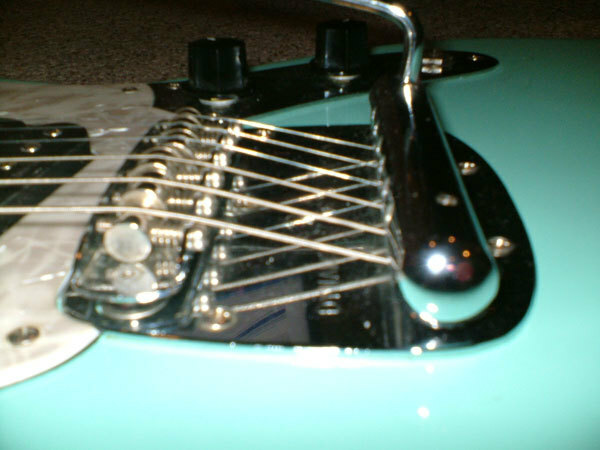 Some Strat players do not tighten the six attachment screws down tightly. This allows for some ‘wiggle’ room. In fact some players remove the four center screws and just use the two end screws. At the bottom edge of the stainless steel plate is a hole to screw in the vibrato bar. At the end of the vibrato bar is a white or black plastic tip. Below the plate is an attached metal block. A large cavity is routed on the back of the guitar. There is also a small cavity routed on the top of the Stratocaster that allows the block to pass through. The string ends are fed through holes in the block and over the bridge saddles. 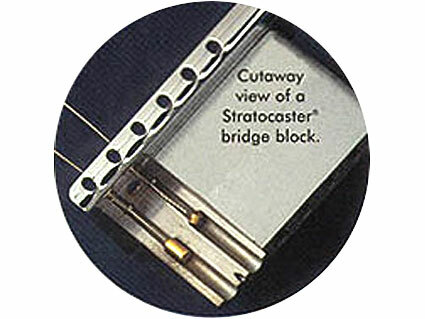 In the rear cavity, three to five coiled springs attach to the block and are secured on the opposite side of the cavity by ‘the claw.’ Early Stratocasters came with five springs, but players seem to prefer only two or three springs. Pressing down on the arm allows the pitch to go down. The tricky part is the up bends. To accomplish this, the six mounting screws can be slightly loosened until you can see the block at the end of the guitar. Heavy strings that have increased tension will also pull the bridge plate upward. The downfall of this unit, like the others is loss of tonality. One tip I use is locking tuners. Most good manufacturers offer locking tuners and they are not much more of an expense than non-locking tuners. Hank Marvin played a red Fender Stratocaster and made great use of the guitars vibrato bar. He had a longer bar that was bent custom-made to hold in his palm while picking the strings. When changing strings remove the thicker sixth string first. Use a wire cutter and cut the bottom of this string about six inches from the ferrule. You now have a disposable tool you can use to push some of the lighter strings out of that vibrato block. 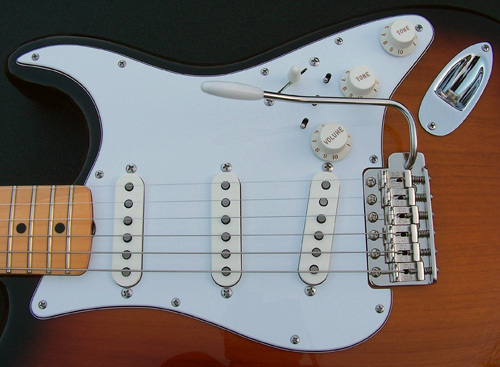 Leo Fender’s next version of the manual guitar vibrato was used for the Fender Jazzmaster and Jaguar guitars. He named this version the “Floating Tremolo System.” The Stratocaster’s synchronized system caused not just the strings to be raised and lowered, but the string saddles as well. The floating tremolo raised and lowered just the strings. The bridge saddle was a separate structure. 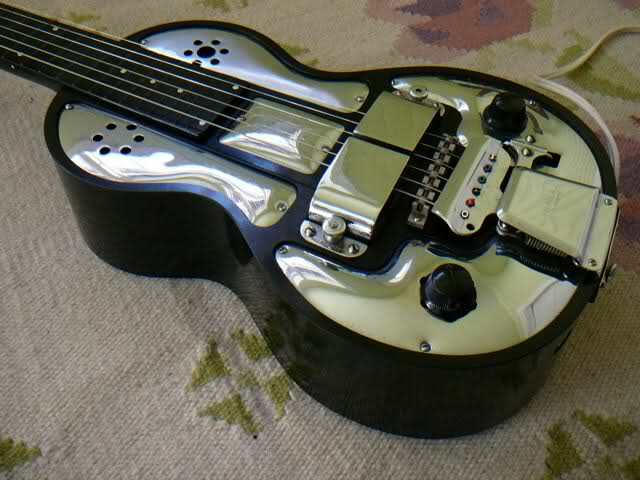 The floating tremolo involved a stainless steel base plate. A raised section that fits in the rear of the unit allows attachment of the string ferrules. A specially milled barrel holds a smaller internal metal plate that is bent into two approximate opposing 90 degree angles. The top of the barrel fits into a hole in the top plate and also one on the internal plate which is held in place by a nut. At the distal end of the internal plate is another structure that holds a short coiled spring in place. 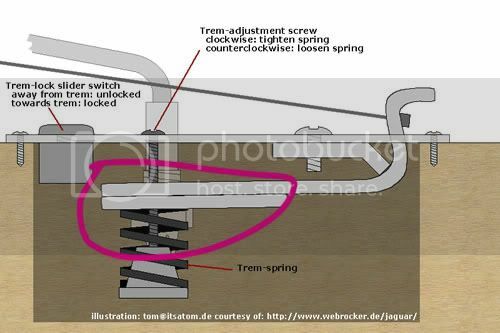 The spring is adjustable by a screw in the plate. A long arm was placed in the top of the internal barrel that allows the player to move the strings up or down. 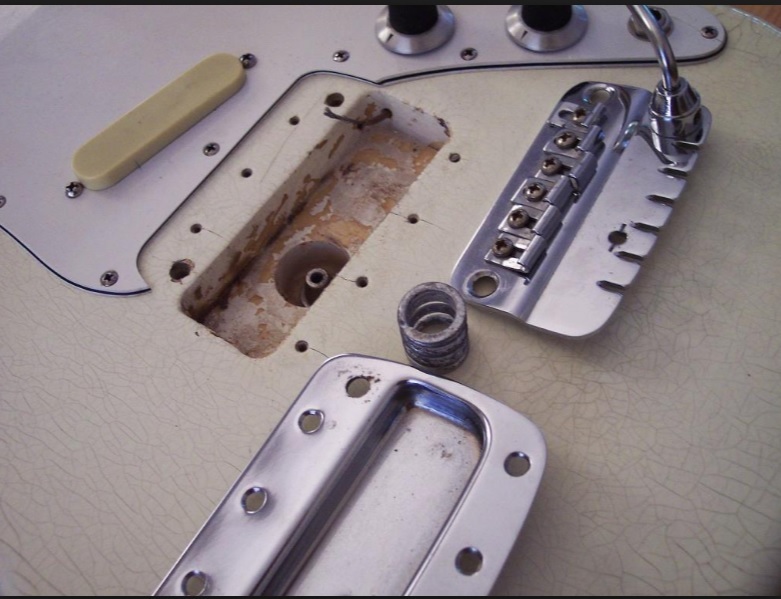 The inner workings of the floating tremolo was housed in a routed area on the guitars top as opposed to the Stratocaster, which housed most of the that guitars system in the rear of the guitar. Perhaps the main difference between the synchronized and the floating tremolo is the floating tremolo works on compression, rather than tension. Leo Fender also included a ‘floating bridge’ in his design. 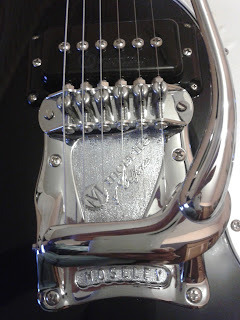 The bridge section of the Jazzmaster/Jaguar is seated on two staffs. The bridge contained 6 bridge saddles that each are milled to look much like machine screws. Each saddle contains an adjustment screw and spring. The bridge can move back and forth along with each move of the tremolo arm. One of the complaints about the Fender Floating Tremolo is the strings tend to move out of the saddles. One fix for this is to use Mustang saddles which have one pronounced groove. 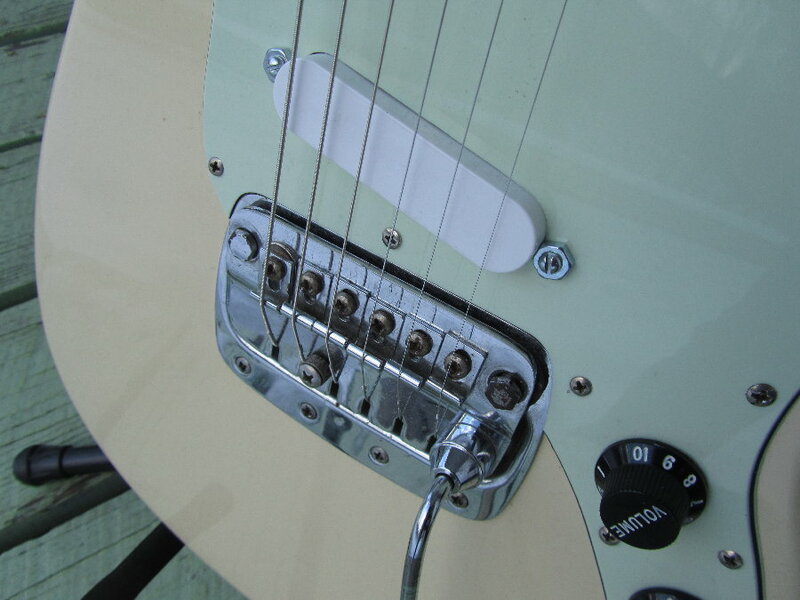 Leo Fender included a sliding button in the design for players to lock the vibrato while not in use. His idea was to prevent de-tuning. 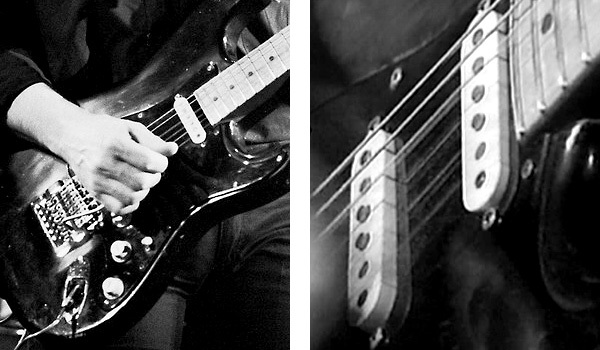 Finally let us take a look at the Fender Mustang’s tremolo which Fender called the Dynamic Vibrato. This unit incorporates a stainless steel plate. At the end of the plate is a stainless steel cylindrical shaped device that holds the string ferrules in place. On opposite ends of the barrel are two posts that fit into corresponding holes on the plate. When the posts are inserted they are held in place by twin springs that are attached to bottom posts of the bridge that protrudes through the underside of the plate. 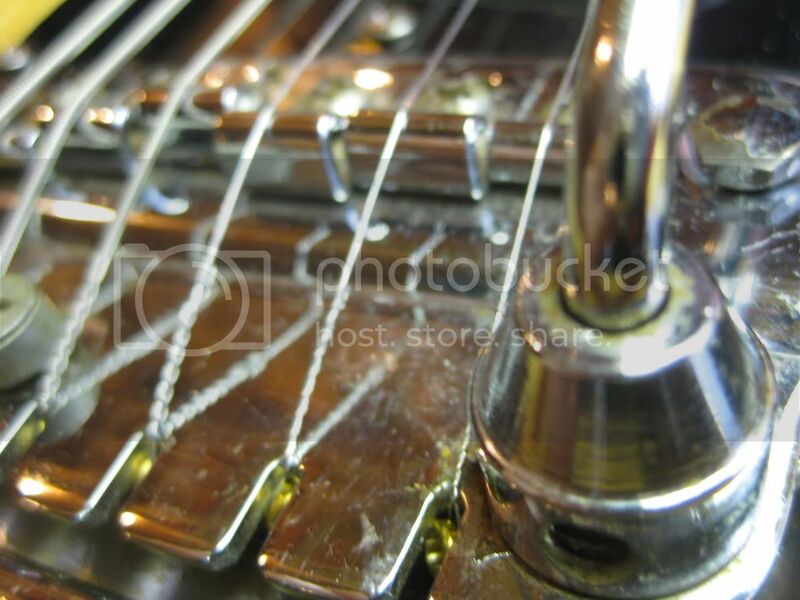 On the upper side of the steel plate is an attachment for the guitar’s bridge and saddles. All of this is placed in the routed area on the body’s topside. The bridge is fixed, but the cylinder that holds the strings moves. It is interesting to note that a few early Mustangs left the factory fitted with the floating tremolos. 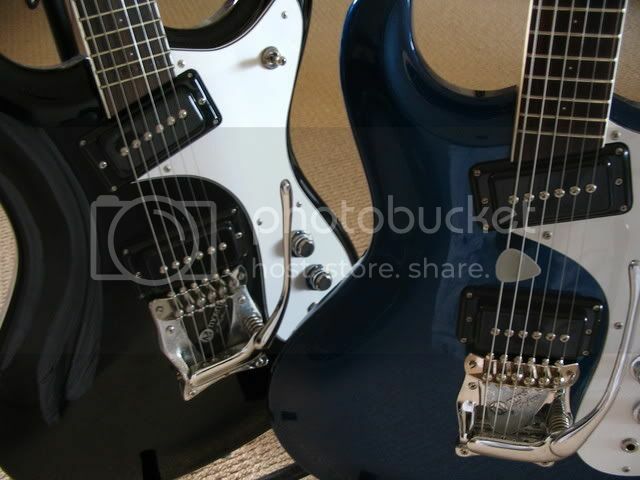 These guitars had totally different routing and mounting holes and the vibrato units are not interchangeable. The Fender Bronco was essentially a student variety of the Fender Mustang. It was a simple guitar design with one pickup. However, the vibrato unit was different from the Mustang vibrato. The Bronco vibrato was similar to the Fender synchronized vibrato by the fact the entire unit including saddle moved when the handle was moved. There are myriads of Japanese, Korean and Far Eastern produced guitars from the post 1980 era that came with vibrato systems. Some were useful, while others were ineffective. Most were based on American designs. Next time we will look at modern vibrato systems.